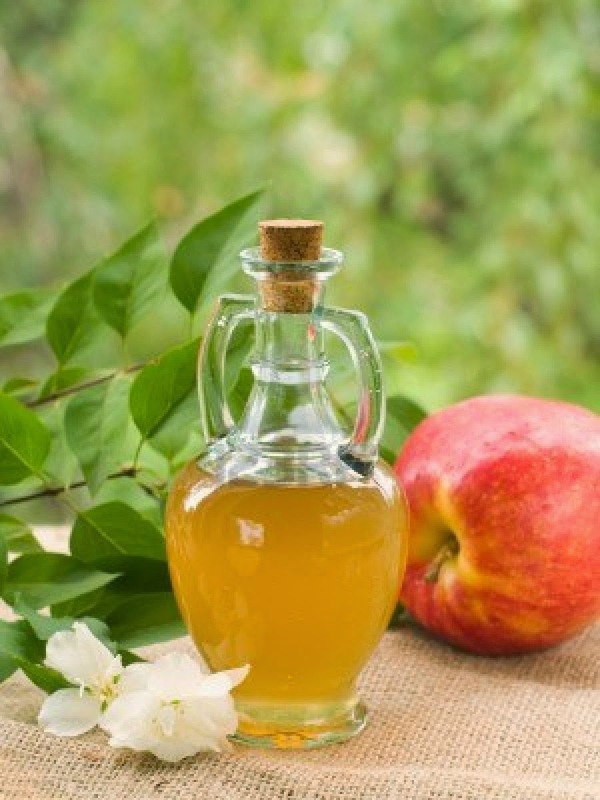 One of my favorite natural products for natural health and beauty is Apple Cider Vinegar. Apple Cider Vinegar, or (ACV) is made by the fermentation of apple cider, and tastes like vinegar but with an “apple” twist. In the natural health crowd, ACV is well-known as a powerful detoxifying and purifying agent as well as internal cleanser. It was even used in the time of Hippocrates (“the father of medicine”) as a remedy for many ailments. ACV contains many vital minerals and trace elements such as potassium, calcium, magnesium, phosphorous, sulfur, and copper. The amino acid in ACV is an effective antiseptic and antibiotic, however, the acetic acid can aid in treatment of various fungal, bacterial, and yeast infections. ACV mimics the acidic environment of the stomach to help food break down. Clinical studies have shown that it lowers blood pressure and also helps regulate insulin levels. ACV is also rich in enzymes and alkalizes your body (i.e., it raises your pH), which is a great way to help prevent cancer since cancer can only live and thrive in an acidic environment. It can also help soothe pain from an itch. ACV is rich in natural enzymes that can help rid your body of candida - yeasts that are attributed to thrush in humans. Candida also creates fatigue, poor memory, sugar cravings, and yeast infections. ACV can help you detox too! Since it balances the body's pH levels, apple cider vinegar creates an overall detoxification of the body. Research shows that it can help stimulate cardiovascular circulation and help detoxify the liver. Research shows significant weight loss benefits from sustained daily intake of acetic acid (which is a main ingredient in apple cider vinegar). To add ACV to your daily routine and assist with weight loss, add 2 tsp. - 1 tbsp. of Apple Cider Vinegar to 16 ounces of water. This concoction can be sipped throughout the day. If you don't like the taste, add some frozen fruit with Sweetleaf Stevia or a natural water enhancer like Skinny Girl Blueberry Acai droplets into water. I promise you won't taste it. treatments! Try a little bit to begin with then increase the amount for more dramatic results. Start with 1/2 a tablespoon of apple cider vinegar and a cup of cold water. Pour the solution through your hair after shampooing. Leave in your hair for a minute or two and rinse. Tip: Make sure you buy Bragg's Organic Apple Cider Vinegar or you'll loose all the important enzymes and nutritional benefits. So mix up your own ACV concoctions and leave me a comment what works for you! good evening - thanks for the article about apple cider vinegar - many people add honey ( you can buy it already mixed and it's called 'honeygar') but much better to mix your own and if one uses local honey - it's great for arthritis and joint pain (http://www.dailymail.co.uk/health/article-1053045/Sir-Ranulph-Fiennes-I-beat-arthritis-vinegar-cure-passed-mother.html) so kills a number of birds with one stone - all the benefits in your article, benefits joints and if you have hayfever will build up an immunity - nature provides yet again!